Following the news that a Chinese car manufacturer has produced a three-dimensional photocopy of the Range Rover Evoque, and there’s nothing Jaguar Land Rover can do about it, it's a good time to take a look at what else is inspiring modern Chinese car design. There's no need to guess this one. The new king of famous Chinese cut and paste car design, the Landwind X7 got Jaguar Land Rover executives, and Twitter, in a right old tizzy when it appeared at the Guangzhou motor show in 2014. 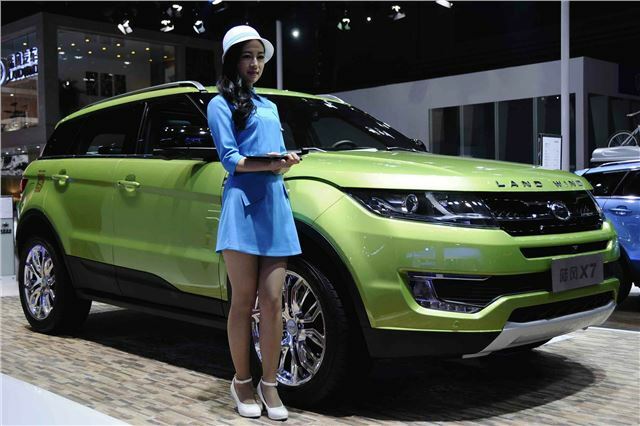 Landwind put it on display again at the 2015 Shanghai show, and will sell it for about a third of the price of the Evoque proper in China – a car that JLR builds in the country in a brand new factory, built to avoid import taxes and therefore keep the Evoque's price down. Still, driving the Landwind is like walking around in a pair of pants with 'Kelvin Klean' written on them, so JLR should be ok.